Travel with Han Solo, Chewbacca and their friends with the LEGO&reg; Star Wars Kessel Run Millennium Falcon. This LEGO brick version of the iconic Corellian freighter from the Han Solo movie features a 2-minifigure cockpit with detachable canopy, 2 spring-loaded shooters, sensor dish, ramp, rotating top and bottom laser turrets with 2 gunner seats, plus a detachable escape craft. This amazing Star Wars toy also features opening hull plates for easy access to the detailed interior, which includes a cargo area with couch and Dejarik hologame table, bar, bunk, missile storage compartment, and a buildable hyperdrive with repair tools. Also includes 6 minifigures and a DD-BD droid. Travel with Han Solo, Chewbacca and their friends with the LEGO® Star Wars Kessel Run Millennium Falcon. This LEGO brick version of the iconic Corellian freighter from the Han Solo movie features a 2-minifigure cockpit with detachable canopy, 2 spring-loaded shooters, sensor dish, ramp, rotating top and bottom laser turrets with 2 gunner seats, plus a detachable escape craft. This amazing Star Wars toy also features opening hull plates for easy access to the detailed interior, which includes a cargo area with couch and Dejarik hologame table, bar, bunk, missile storage compartment, and a buildable hyperdrive with repair tools. Also includes 6 minifigures and a DD-BD droid. Added hundreds of Lego's detailing features inside and out, still 100% original Lego's in the model and functional. Extended the build for days!!! Fantastic set, most challenging one I've done, Also the bed you have to build just sort of slides around inside! I Love this Star Wars LEGO! It is fun to build and play with! Compare For Yourself! The New Falcon Is Worth It! I looked forward to this Kessel Run Falcon as it was bringing something fresh to the collection. I love the colors and added changes to the ship we've all grown up and loved. Easy to build with lasting quality, the set holds together well as I move it about rearranging the collection. Well worth the price for the collector and kid alike! For those who mentioned that the gap is more noticeable, it's only slightly more noticeable around the corridors. I've included images for comparison! From left to right, 75212, 7965, and 75105. If you are on the fence, hopefully this will help you, you won't regret it! My son, grandson and myself built this. MY son loves playing with it. For the most part, it stays together well. The gun turret on the bottom seems to come off quite easily though when he put mini-figures into the "gunners seat" that's not really a seat but anyway... Also the ramp that is used for egress is hard to get to and is kind of worthless and if you didn't know it was there, you cant tell. Like a few others have said, you cant seat or stand the mini-figures in all places you would expect and close the top properly. With all that, this was really a fun time spent with my son and grandson assembling this together. My son loves to play with it now that it is done. I do have to put a few things back together when hes done but that's OK. They are meant to come apart and be re-assembled. That's what LEGO's do! This was a great build. I have only recently become interested in Lego again in the past couple years. This was my first large Star Wars set. I have read some other reviews and I am not sure why the negativity. Last time I checked, Lego makes toys. While I know that there are varying degrees of difficulty on the many sets, they are made of plastic. I do not see any problem with any "gaps" or the ability to see into the Falcon as one reviewer described. 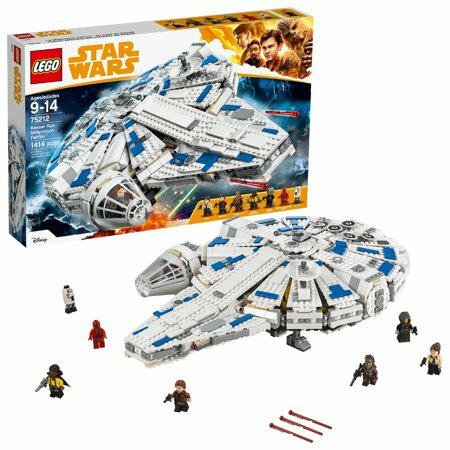 I also am pretty sure that Han Lando didn't actually use this Lego version to do the Kessel Run. This was a fun build with a beautiful color scheme. I love the Kessel Droid. It is a great set. Spoiler Alert: Star Wars sets cost a premium, and I have to say it might be worth paying. Decent model of the falcon, especially if you don't have a falcon in your collection, plus the added bonus of Lando ( who originally owns the falcon),Han and chewie figures! Ship looks ok as a display model too as long as you don't scrutinise it as you would the ultimate versions.. Still impressive though especially as the ship has extra detailing to show how the falcon looked before its was modified/aged in later films. I assume as with most Lego sets the desire to not put all main characters of one film in one set means hopefully we will get figures of Dryden Vos ( villain) and L3-37 (landos droid co-pilot of the Falcon) and Rio Durant in later sets.. Enjoyable and worth the money. As your sets are thought to be "overpriced" I'd say this one is worth it. I was looking around and I saw this one and I was looking for something Star Wars related that had space inside and this was the one. The only complaint I have is that the landing legs/feet/gear (whatever they're called) are a little basic, but at least they work.